If identifiable companies have been to your website and their movements through your website indicate that they’re good prospects for you, then LinkedIn can help you make contact with them in a way that they find less threatening than a direct phone call. 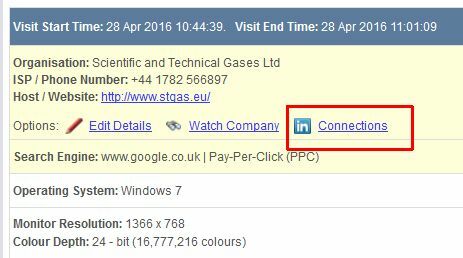 Within the A1WebStats system, many companies have a ‘Connections’ link, which will take you to LinkedIn, identifying people who are currently at that company or have worked there previously (which can sometimes be useful if they’re known contacts). 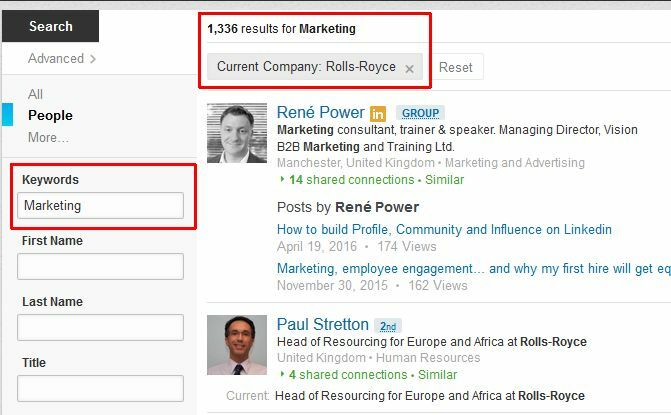 If you don’t see a Connections link you can still copy/paste the company name into LinkedIn to see employees of that company. What works quite well is to use the LinkedIn filtering bar to filter company employees down to those that match certain parameters. For example, entering ‘marketing’ into the ‘Keywords’ or ‘Title’ fields as shown in the example below. It probably wasn’t you personally, but we picked up that someone from [your company name here] came to our website [website name] on [date] and looked at our pages about [details here]. Would you know who that could have been as I’d be interested in talking with them? Thank you in anticipation that you can help.